New Rochelle, NY, April 2, 2019–A new study found a surprisingly high rate of metabolic syndrome among individuals aged 60-100 years. Three easy-to-measure anthropometric indicators were predictive of metabolic syndrome in both men and women and could be useful for indicating the need for preventive care and further testing, according to the findings published in Metabolic Syndrome and Related Disorders, a peer-reviewed journal from Mary Ann Liebert, Inc., publishers. Click here to read the full-text article free on the Metabolic Syndrome and Related Disorders website through May 2, 2019. The article, which evaluated nearly 500 elderly individuals, is entitled “Performance of Anthropometric Indicators in the Prediction of Metabolic Syndrome in the Elderly” and was coauthored by Carla Helena Augustin Schwanke, MD, PhD and colleagues from Pontifical Catholic University of Rio Grande do Sul, Brazil. About 60% of the study participants had metabolic syndrome. The researchers assessed the predictive value of five anthropometric measures in men and women, which included waist diameter (from front to back), waist diameter/height, neck circumference, and indices comprised of a combination of weight, height, and waist circumference. All of these measures are easy to obtain in a primary care physicians office. “This study reinforces the importance of simple clinical observation and measurement in the effort to recognize and treat metabolic disease associated with obesity,” says Dr. Adrian Vella, MD, FRCP (Edin.) Editor-in-Chief of Metabolic Syndrome and Related Disorders and Professor, Mayo Clinic College of Medicine, Rochester, MN. 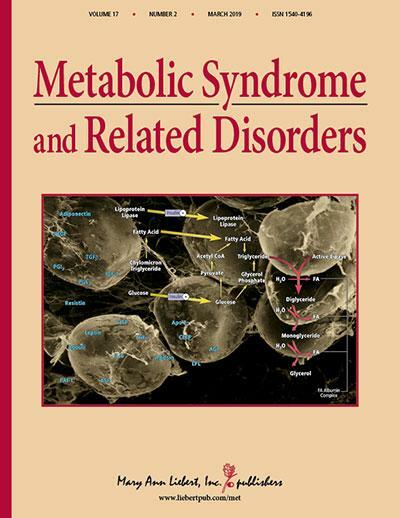 Metabolic Syndrome and Related Disorders is the only peer-reviewed journal to focus solely on the pathophysiology, recognition, and treatment of metabolic syndrome. Led by Adrian Vella, MD, FRCP (Edin. ), Professor of Medicine, Endocrinology, Diabetes, Metabolism, and Nutrition, Mayo Clinic College of Medicine, Rochester, MN, the Journal covers a range of topics including insulin resistance, central obesity, glucose intolerance, dyslipidemia with elevated triglycerides, predominance of small dense LDL-cholesterol particles, hypertension, endothelial dysfunction, and oxidative stress and inflammation. Complete tables of content and a sample issue may be viewed on the Metabolic Syndrome and Related Disorders website.